My number one objective in Rise of Iron is to get a God Roll version of Dead Orbit’s new shotgun, the Last-Ditch 001. It’s the same archetype as the beloved Matador 64, and you can watch gameplay with it in this video that shows off its deadliness. I want this shotgun because I normally use a shotgun in Trials of Osiris and need to remain competitive. I’m also considering getting into tournament play. Now, I know only a small portion of the player base will be entering tournaments, and maybe you don’t even play PvP. If that’s your case, you don’t need a Last-Ditch. However, each of you may have a reason to want a different weapon or a different piece of gear. Maybe you’re a fusion rifle guy, or maybe you think the New Monarchy helmet looks super cool. If you have your eyes set on even just one faction item, and you want that item as fast as possible, there are things you can do prior to the DLC dropping to increase your chances of that getting that item early on, which I’ll explain. Without the ability to reroll perks, the only way to get a God Roll on this shotgun or another item you want is to earn and open as many faction packages as possible. The more packages you open, the more opportunities you have to obtain your preferred item, the more opportunities you have to roll godly perks. To get these packages you need to accumulate 2500 reputation with a faction. You can do this by trading in Motes of Light, Armour Parts, Weapon Parts, or Special and Heavy Ammo Syntheses. To get the most packages, you want to stock up on the items that give you the most reputation per cost. Two currencies that most players have a surplus of are Glimmer and Strange Coins. To get each additional rank, meaning the 2500 rep it takes to level a faction, it would cost you 25 Glimmer buying Weapon Parts, 40 Glimmer buying Special Ammo Syntheses, or 38 Glimmer buying Heavy Ammo Syntheses. Therefore, any excess Glimmer you accumulate should be spent on stacking Weapon Parts to optimize how many packages you can open on September 20th. The other currency is Strange Coins. 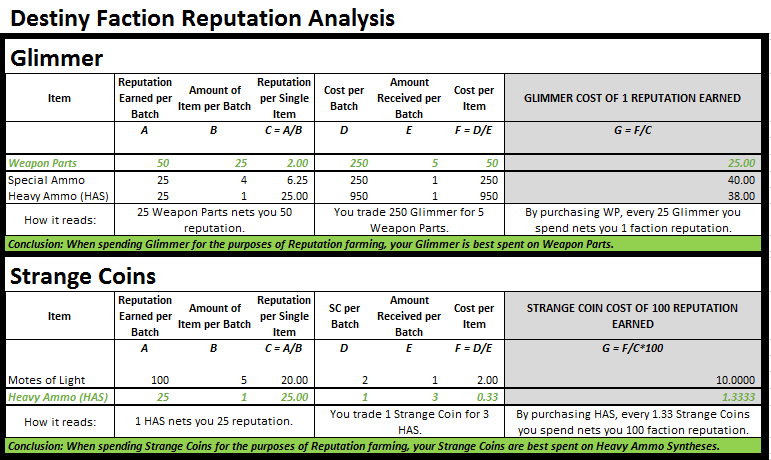 It would cost 10 Strange Coins to earn 100 reputation through the Motes of light method, but only 1.33 Strange Coins for the same 100 reputation via Heavy Ammo Syntheses. Therefore, when you have spare Strange Coins, always burn them on Heavy Ammo Syntheses to optimize your reputation gains. With the raid being released only 3 days after RoI drops, I’ll be doing everything I can to get my light as high as possible from Tuesday to Thursday. In previous expansions, you could immediately purchase higher level gear from vendors using Vanguard/Crucible/Legendary Marks. There’s a possibility we can expect to get some kind of Light boost through purchasing gear from vendors and opening faction packages. After that, there are a few things you can do to effectively exceed the cap by saving up beforehand. The most effective way to do this would be to complete, but not hand in, the Trials of Osiris bounties on all three characters this weekend. This is the last weekend for Trials and you can save 2 bounties worth 25 Marks each. If you do this on all three characters, you’ll have an additional 150 Marks ready to be redeemed. Next, fill your vault with purple gear and weapons. Ideally, if the vendor gear is higher than 335 light, you would spend X amount of Marks on a pair of boots, dismantle legendary gear to hit the cap again, buy a chest piece, and the repeat for the helmet, gauntlets and whatever else you can get your hands on to immediately increase your light level. Getting an early start is critical, because we know in the past that your current light level has had an impact on the light level of your drops (court of Oryx for example). So the higher light you are before you start participating in the new content, the higher drops you will get, the quicker you’ll reach 385 light. When Bungie developers were asked if we should hang onto Exotic Engrams, the developers smiled and opted to not answer the question. This might imply that they have something up their sleeve. Regardless of whether or not pre-DLC engrams can return new gear after RoI drops, there is still an incentive to stock up on these. At best, they might actually give you new exotics at higher light levels. At worst, they’ll rank up your Cryptarch. As you know, when your Cryptarch rank is leveled up, you get new engrams. These engrams, because they are received after the expansion drops, may turn into Rise of Iron gear and potentially increase your Light. We discussed saving legendary gear for the purpose of hording Legendary Marks. If you run out of space, prioritize engrams over weapons and gear. This is because engrams will get you post-DLC Cryptarch packages, but also turn into the same Legendary Marks that your already decoded gear will turn into. Extra Glimmer? Buy Weapon Parts. Extra Strange Coins? By Heavy Ammo Synths from Xur. Make sure you hit the cap of 200 Legendary Marks. Complete, but do not hand in your Trials bounties that provide Legendary Marks on all of your characters. Save all legendary gear to be dismantled post-DLC. If you run out of space, prioritize engrams. Ultimately, the most important thing is to enjoy the expansion in whichever way you prefer. Whether you’re like me and race to the finish, or you’re a “stop and smell the roses” kind of Guardian, I’ll see you out there on the 20th of September. Dukaness out.